Achieving the ultimate in graphic layering and video compositing isn’t easy, but VIA Studios makes it seem that way- with seasoned award-winning on-line editors in 5 Final Cut Pro edit suites for full 1080i HD for superior video and audio quality, and a user-friendly environment that eliminates downtime and boosts productivity. Superb editorial and engineering skill combined with the industry’s most versatile editing equipment enable us to deliver high-end seamless results and a competitive edge for your product-in less time than you ever imagined. 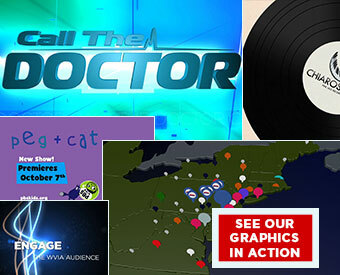 Put our award-winning graphic designers to work on your production. We have the high-tech facilities that make your productions sizzle. VIA Studios’ leading high-end animation and visualization software systems employs the open architecture that offers a complete complement of tools for creating a full spectrum of special effects in modeling and manipulating complex 2D and 3D imagery. Sophisticated illustrations and animation also equip our graphic designers with the power to add a new level of imagination to your productions… and make technology fun. Benefit from our solid industry experience enhanced by the vision of tomorrow. Take advantage of the valuable footage currently existing in older formats and the quality and cost benefits of advanced technology. VIA Studios has the ability to operate in analog and/or digital environments.